Use the form below to contact accommodation Hotel Magellan Inn directly. A/C room with choice of King size bed or 2 twins. Private terrace overlooking garden with hammock. Coffee maker, private bathrooms with hot running water. WiFi SKY TV offered as extra. Choice of King size bed or twins. Private terrace overlooking gardens with hammock. Coffee maker, private bathrooms with hot running water. WiFi. SKY TV offered as extra. A/C room with choice of King size bed or 2 twins. Large private terrace over-looking garden with hammock. Fridge & coffee maker. SKY TV offering a multitude of movie,news channels etc…Private bathrooms with hot running water. WiFi. Cahuita is popular amongst the young and footloose. The town exudes a free-spirited charm, and lies near a number of attractive white and black-sand beaches. The beaches are pleasant places to spend the day, and the adjoining Caribbean offers up gorgeous turquoise waters that are perfect for swimming, snorkeling or scuba diving. The restaurants in town starkly contrast some of Costa Rica’s more traditional culinary styling, serving up zesty meals that often fuse a variety of European-rooted cuisines. 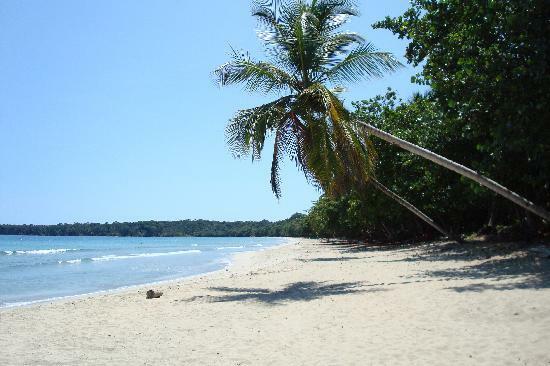 Cahuita also serves as the gateway for trips to the Cahuita National Park, which offers visitors a wide range of activities and tour services, including access to Costa Rica’s largest coastal reef. Hotel Magellan Inn smoothly blends the vibrancy of the tropics with the comfort of the hotel, creating a laid back ambiance that invites relaxation and enjoyment. Decorated with exotic artwork and wooden furniture, the rooms are clean, tasteful and charming. Each come equipped with a private hot water bathroom, ceiling fan, wireless internet, and private terrace. The terraces are spacious and comfortable, with sitting chairs that overlook the hotel’s lush tropical gardens and sunken swimming pool. Nights at the hotel can be enjoyed at “La Casa Creole Restaurant”, which offers a wide selection of tasty French Creole dishes. In fact, the restaurant is regarded as one of the best dining options in the entire Cahuita area. The hotel’s adjoining cocktail bar provides guests with a pleasant place to relax afterward, serving up refreshing drinks amongst an extremely amiable environment. Hotel Magellan Inn also offers a variety of tourist services, including pickups from San Jose, fishing and snorkeling tours, waterfall hikes, and horseback rides.